Georgia loves to paint outdoors and her work is a reflection of her emotional response to the world around her, painting subjects in an expressive manner. 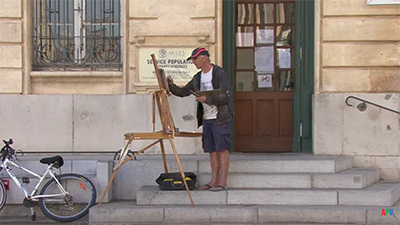 Starting in the studio, she shows us a variety of techniques which she then uses in her paintings en plein air. 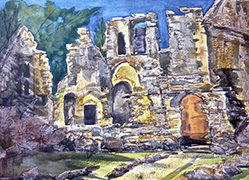 Her subjects include a lovely kitchen garden, the rolling Cotswold landscape and the fascinating ruins at Minster Lovell. 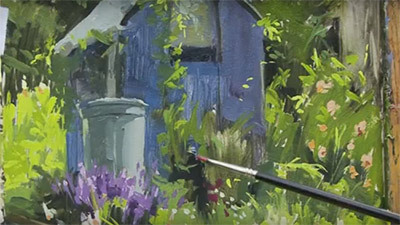 She also paints a studio painting of flowers to further demonstrate some of these techniques. 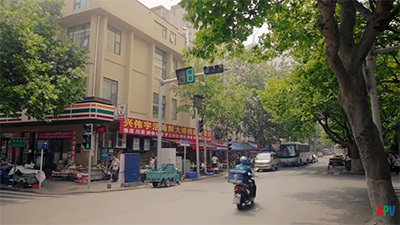 This is not your typical APV film. 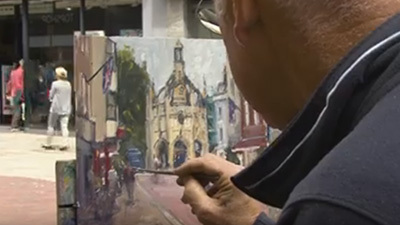 This much is apparent from the very beginning, where we�re in a studio setting for some 25 minutes, learning some fairly basic techniques such as the use of salt, sgraffito, drybrush and lifting out. If you�re used to the more inspirational style of work � the artist painting and explaining as they go, this will come as something of a shock. You might also be tempted to hit the fast forward button on the grounds that this isn�t what you came for and you know it already. That would be both a shame and a mistake, as Georgia�s explanations are particularly clear and the section forms the groundwork for the demonstrations that follow. These are not ideas that have been pulled out of a hat to fill a space in the programming, but the absolute basis of how Georgia works � she very much practises what she preaches. I was also intrigued by her use of a mobile phone app to reduce photographs to monochrome in order to establish lights and darks. 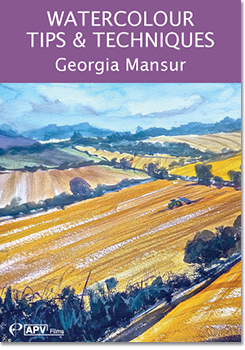 I haven�t seen this before and Georgia uses the result to make a tonal diagram with a black felt-tip of each scene she paints, something which is invaluable in building up colours and values. The four demonstrations are filmed in and around the Cotswolds: the garden of the rather beautiful studio we start in, an autumn field and the ruins of Minster Lovell hall. The fourth piece is a studio-based floral that�s entirely reliant on tones to capture both positive and negative shapes as well as form and recession. Although this is not a typical APV piece, it�s a valuable film that offers a great deal of technical advice. It will undoubtedly have appeal to the less advanced painter who is not so familiar with some of the tricks of the trade. The more experienced, though, may well admire the way Georgia puts some neat effects into practice seemingly without effort. Given the nickname 'The Art Whisperer' by her students, Australian-based Georgia Mansur is passionate about sharing her techniques with others. 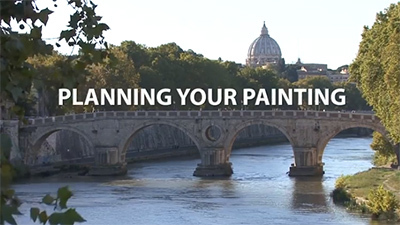 She runs workshops through Australia and all over the world and this new DVD from APV Films, Watercolour Tips & Techniques brings her to England. 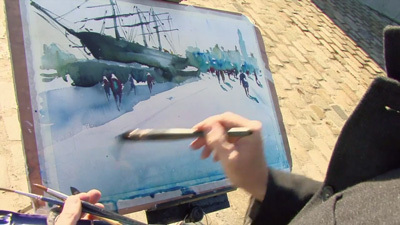 The film opens with Georgia in her studio, from where she demonstrates a number of techniques she later uses in her en plein air demonstrations. These include a kitchen garden, a Cotswold landscape and the ruins of Minster Lovell. 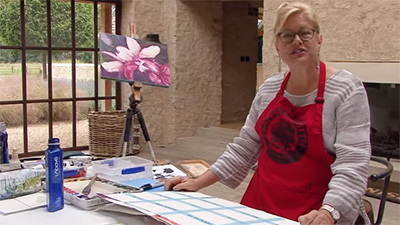 She then returns to her studio where she demonstrates a flower painting. There's much to learn here from a popular tutor whether you are a beginner or have some experience of the medium. Technical work is usually limited to a short section near the end of a typical APV DVD. This differs, however, in having a detailed technical introduction. It's a brave departure as it's not what you expect. But there are plenty of valuable hints and it's the basis for the four demonstrations that follow. Think of it as a musician practising scales before essaying the full Mozart. Georgia's techniques include salt, sgraffito, drybrush and more that will all be largely familiar. I was particularly interested in her use of a mobile phone app to reduce photos to monochrome and find values. This is her starting point in all her paintings and an excellent foundation. This is a useful film.